The Dodge Journey is a four-door crossover that seats up to seven passengers. The Dodge Journey is manufactured in Toluca, Mexico alongside the Chrysler PT Cruiser. Dodge has long been one of the few automakers to offer a full line of vehicles ranging from the compact Caliber up to the full-size Ram pickup. One area that Dodge has lacked, however, is in the profitable market of crossovers. For 2009, Dodge introduced its all-new Journey midsize crossover. While the new Dodge Journey essentially replaced the short wheelbase version of the Grand Caravam, the styling and interior comfort are improved, as well as dropping the perceived stigma that comes with owning a minivan. Unlike the Chrysler Pacifica that shared its underpinnings with Chrysler’s short-wheelbase minivans, the Dodge Journey rides on a Mitsubishi Lancer-based platform shared with the Dodge Avenger. The Dodge Journey is available in three trim levels (SE, SXT and R/T) and offers seating for either five or seven. From the trademark crosshair grille to the bold bodylines and flared wheel arches, the Journey’s look utilizes some of the more impressive visual designs Dodge has to offer. Compared to its main domestic rivals, the Journey’s overall look is more palatable than the Ford Flex or Chevrolet Traverse. 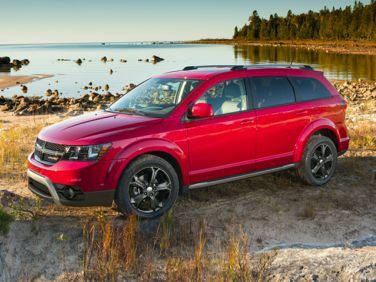 Both the Chevy and Ford chose to use somewhat polarizing styles, while the Dodge Journey sports a relatively conservative, yet inoffensive, with obvious inspiration coming from other Dodge cars such as the Avenger and Caliber. The squared off front end and swept roofline help make the Journey look and feel bigger than it actually is. In previous new cars, Dodge is often criticized for cheap, hard materials, but the new Journey bucks that trend. Although the lay out is a bit unconventional, most of the major surfaces, including the door panels, upper dash panel and seats, offer a softer and more upscale look and feel compared to recent new car introductions. Like its minivan relatives, Dodge squeezed innovative storage holds and cubbyholes into just about every nook and cranny inside the Journey. Under the passenger front seat and under the foot area for the second-row passengers, Dodge integrated clever cubbyholes for the storage of small, clutter items. Similar to the seats we liked on the Volvo V70 and XC70, the second row of seats offers optional child booster seats integrated into the seat bottom. For maximum storage capacity, both rear rows (when equipped) of seats fold flat as well as the passenger front seat. Under the hood, the Journey comes is offered with two available drivetrains. The Journey SE comes with a 173-horsepower 2.4-liter inline-4 mated to a four-speed automatic transmission that attains EPA fuel economy estimates of 19 miles per gallon in the city and 25 mpg on the highway. Stepping up to the SXT or R/T trim, the Journey upgrades to a 235-horsepower, 3.5-liter V-6 mated to a six-speed automatic, but the added power results in slightly decreased fuel economy numbers with an estimated 16 mpg city and 23 mpg highway. Front-wheel drive is standard on all Journey trim, but electronically controlled all-wheel drive is available on the SXT and R/T models. To provide a smooth, comfortable ride in the Journey, most suspension components are a direct carryover from the Avenger sedan including the MacPherson struts in the front and multi-link independent suspension in the rear.